For a country where culture certainly isn’t lacking, it’s no surprise that the Western world in the 19th Century – just after Japan opened up – was in awe of it. Coming from Asia, I can hardly think of a place that is more dissimilar to where I come from in Asia than Japan. Japan is so different from the rest of Asia, let alone the rest of the world. Besides, if you’ve ever been to Japan, there would be no real need for me to extol the numerous attractions of this country. An isolated country for hundreds of years before the 18th Century, Japan consists of 4 main islands (out of 6,842) on which 127 million inhabitants live. It’s a stratovolcanic archipelago, and a unique one at that. It’s a beautiful country, with deep pockets of untraversed land next to vastly densely populated cities, of which Osaka (on Honshu island)has to be one of the most vibrant. The second-largest city in Japan after Tokyo, Osaka is home to many famous restaurants, shops and hotels. It’s one of Japan’s most frequented tourist destinations and yet, it doesn’t feel touristy at all. The commerce there isn’t aimed at tourists only, and many restaurants still have Japanese menus with Japanese-only speaking staff. Of course, it’s a monolingual city like the rest of the country so communication can be an issue sometimes. My first meal in Japan was pretty memorable. We had a kaiseki dinner when we first arrived at Fushioukaku in Ikeda (a 30-minute car ride from central Osaka). A kaiseki dinner is a multi-course meal that consists of many appetisers and main dishes, where the dishes reflect seasonality and freshness. It can be very elaborate and is usually served at ryokans but not always. It’s meant to reflect Japanese hospitality and the seasonality of ingredients. Japan’s version of haute cuisine/fine dining can seem quite formalised; its sense of tradition being so different to any other culture’s. Certain dishes have to be present, and the order the dishes are served is decided by the chef. For modern, experimental chefs, the ingredients used and the way the dishes are prepared can vary and can be very innovative. 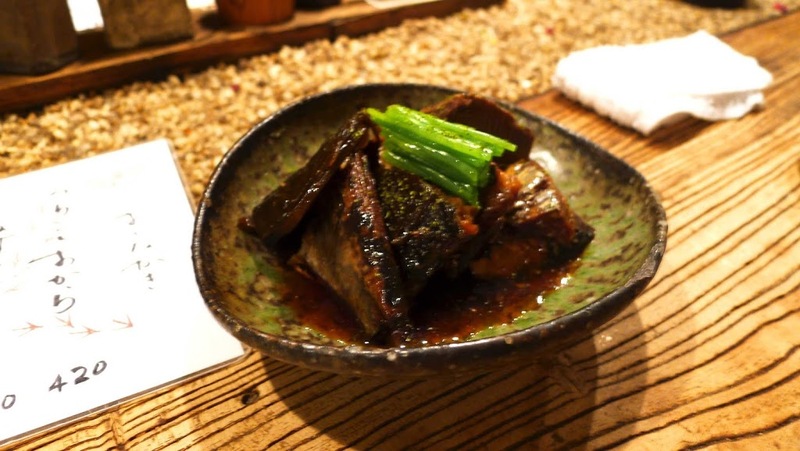 At Fushioukaku, there is a strict time for dinner to be served. Japanese people are very punctual and inflexible sometimes. Our flight was delayed and after some pressuring (on my side), the ryokan decided to serve our dinner, but only on the condition that we not arrive after 8.30pm (dinner started at 7.30). So we went straight to dinner without checking in, as instructed by the hotel staff. 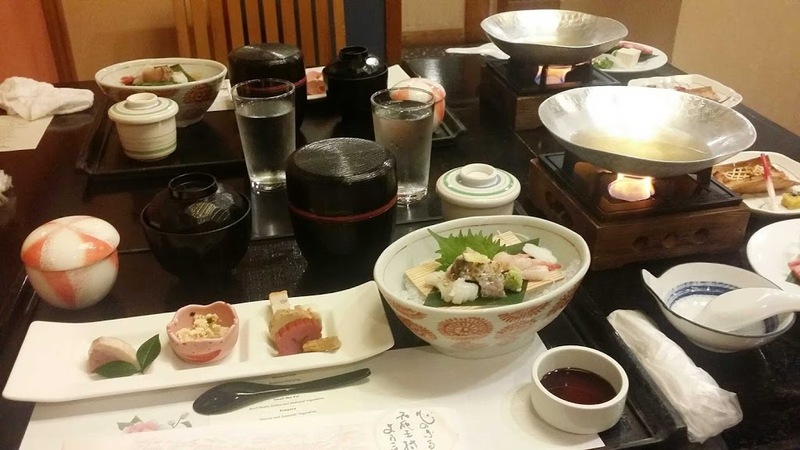 From left to right, gooey Japanese dumpling, soup, rice, chawan moshi, shabu shabu saucepan, grilled fish, fresh sashimi, assorted kamoboko and appetizers including garnishing such as pickled daikon and ginger. It was a marvelous spread of yakiniku shabu set, a selection of appetizers (kamoboko), soup, sashimi, chawan moshi, grilled fish and tempura, rice, tea and dessert (crème brulee nonetheless!). 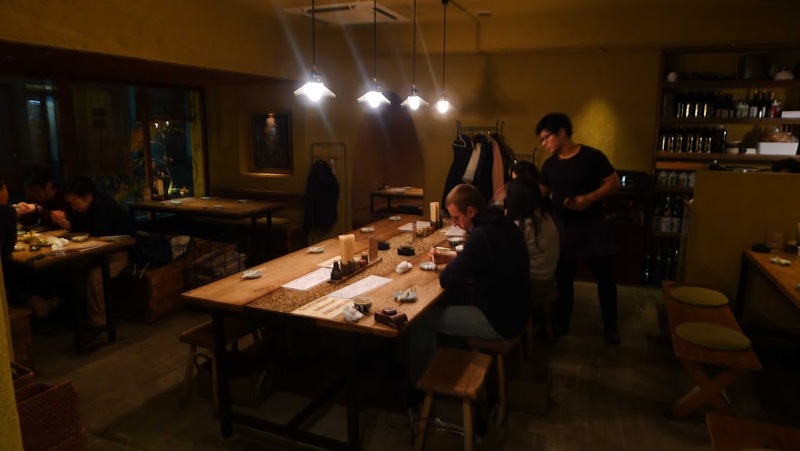 Everything was well-prepared on arrival, and because all of our dishes were served at once as we were late, I didn’t know what order I had to eat the dishes in – everything was gobbled up rather haphazardly – so much so that a Japanese couple sitting next to us was a bit surprised! I also didn’t know what I was always eating quite often, but that added to the pleasure of playing the guessing game. The sashimi was sweet and juicy, with the essence of the seas brought to life, and the tempura was deep-fried to crisp perfection. There was a sweetish, gooey Japanese dumpling appetiser made from what I gathered to be some sort of radish, which was interesting. The Hokkaido milk crème brulee however was divine – just the sort of thing you would be wishing for after hours of travelling by plane then car. It was warm and creamy, while having just the right amount of sweetness and zing to it! The beef was lovely and tender, and when we cooked it in our little sauce pan, with fresh enoki mushrooms and tofu and leek, dipped in yuzu shabu sauce, one could melt along with the fat in the beef. I went back to my room feeling full but stuffed; they portioned everything so well that I didn’t overeat or undereat! When we moved to the city the next day, we visited another restaurant which serves mainly soba dishes and yakitori. We went there after a visit to the nearby Osaka castle. * When we got there, they were closed at 5pm but would re-open at 5.30pm for dinner. We were lucky enough that when we went back at 5.45 pm they took us in. They would not take other walk-in guests who came later than 6 as there were bookings already. The restaurant itself is not big, it has seating for about 50 people and has a nice, cozy Japanese vibe. The minimalist Japanese style and warm interior (literally too!) left me feeling right at home, not to mention the hospitable and friendly staff. The restaurant’s dinner lighting conveys a mysterious atmosphere. This adds to the charm of the restaurant. We ordered 2 bowls of soba noodle (one with egg), which is made from wheat flour, and a grilled fish dish. What came bowled us over. The chewy texture of the noodles, combined with the flavourful broth and fresh ingredients made it a really special bowl of noodles. The soba did not taste like the usual commercial wheat flour soba, but had the consistency of al dente pasta, along with a slightly crunchiness that was almost undetectable. It was freshly made soba as well – you could see them making it – which just goes to show the importance quality and freshness of the ingredients make in Japanese cooking. The grilled fish, while sweet, was well cooked and made a nice pairing with tea and soup. The soup was very good and tasted of sweet seaweed, wonderfully flavoured and light. The egg which I had on mine was nice and runny – it blended all the fresh ingredients together. Sweet, fresh grilled fish marinated in what seems to be sweet miso and some other sauce…. At the front of the restaurant, you can sometimes even watch the soba noodles being made! The menu was all in Japanese, but there was a member of staff who spoke a bit of English. The way the staff helped us take off our coats, and took our order, waved us goodbye – is the level of service where one feels well-taken care of. The Japanese hospitality is something I’ll never forget. I left Japan feeling like I had discovered a whole new world. I’d only been to Japan once when I was about 10 years old. This trip however, was a special one. I really appreciated the Japanese hospitality, service and attention to detail which clearly shows in their food. *I found this restaurant randomly on Google Maps when scrolling for places to eat near attractions we are going to visit. Google labelled the venue a ‘soba noodle shop’. Unfortunately, they don’t take bookings. A popular chain of bun shops called 551 Horai at the Osaka JR Tennoji station serves very good buns.